The knife-block was invented for children in the age of 12. And it would be no problem, if they are not precise - the function is always the same, even if the joint is loose. First: I wanted to make something handy for the time, when the project is done! Everybody has a knife in the kitchen to store and so the thought of a knife-block was born. Second: The project should be easily prepared - organization of materials should be no big deal, therefore it should be handy in preparation-time. Third: It should be handy for the time during the education in woodworking classes. Therefore you need in this project the basic tools and the basic techniques for this tools: sawing, chiselling, drilling, filing, nailing and a little planing and sanding - beside of measuring and marking out and using a square. These woodworking abilities are mentioned in the curriculum for children age 12 here in Austria. Here is my plan of attack for this project: First you cut the five long rails to size, make a package and drill in a hole for the dowel you instantly put in (this is nice for working all rails together at the same time by planing the edges on the shooting board or sawing the top joint with the two crossing rails - first you set the depth of the crossing rails with a marking gauge and sketch the position with a square; cut in several times that you can easily chisel out; round the edges of the block with a rasp and a file). 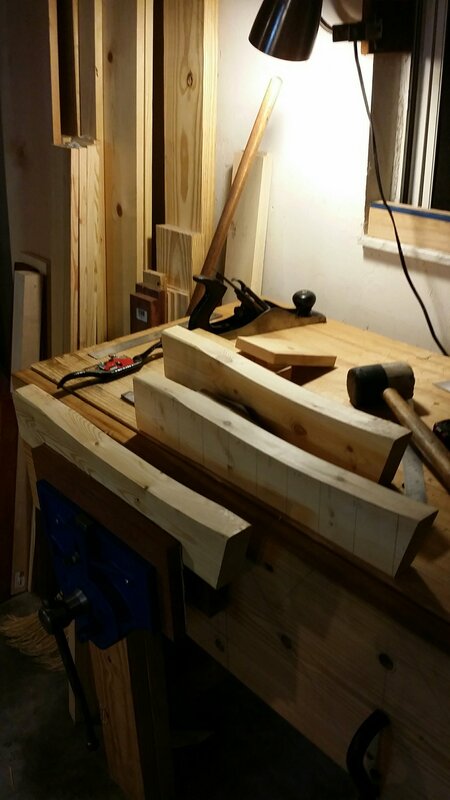 Afterwards you cut the 7 short rails (use a miter box for sawing-beginners). Now you put out the dowel and chamfer all the long rails everywhere - a perfect exercise for chamfering: long side with the plane, short side with a chisel. Put between the long rails distance-plywood-strips and clamp the block together and nail down the bottom-rails with a triangle-sketch that you don´t nail parallel to the grain because of the danger of splitting - afterwards sink all 25 nails a little bit. Glue in the top-rails and sand the sides on level. Break all sharp edges with sandpaper. Fourth: You should have a choice to make special features in your individual knife-block, that you can put in some ideas of design of your own. You can take different kinds of wood for design and for teaching different qualities and types of wood. You can change the shape of the knife-block - just some ideas: make out of the rectangular edges round edges or take a 45 degree angle on one side or both sides, file in a curve in the middle.... you can change the level of difficulty of the joints for individualisation (some kids are fast, some are slow) - downgrade: instead of chiselling in the two top-crossing wooden rails just nail them down or glue them (think about making the top-rails not flush, it´s easier); upgrade: chisel in the 5 bottom-crossing wooden rails. And I am sure that there are many more possibilities for own ideas! and I am curious which project you will make. The stick chair has been patiently waiting for a couple of weeks for the last bit of work before finish. What has it been waiting for? 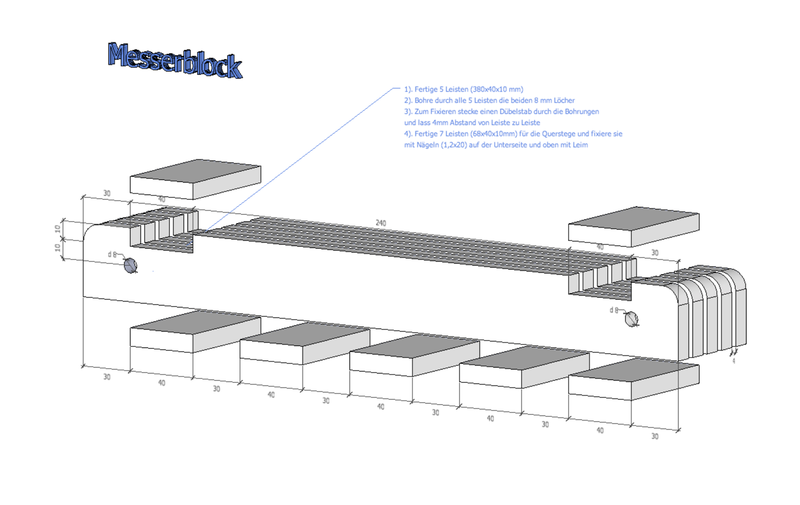 A German shipping company to get it's act together to deliver some epoxy I ordered. A shipping company took more than two weeks to deliver this epoxy. Note one of the containers is damaged, but luckily no leaks (yet). 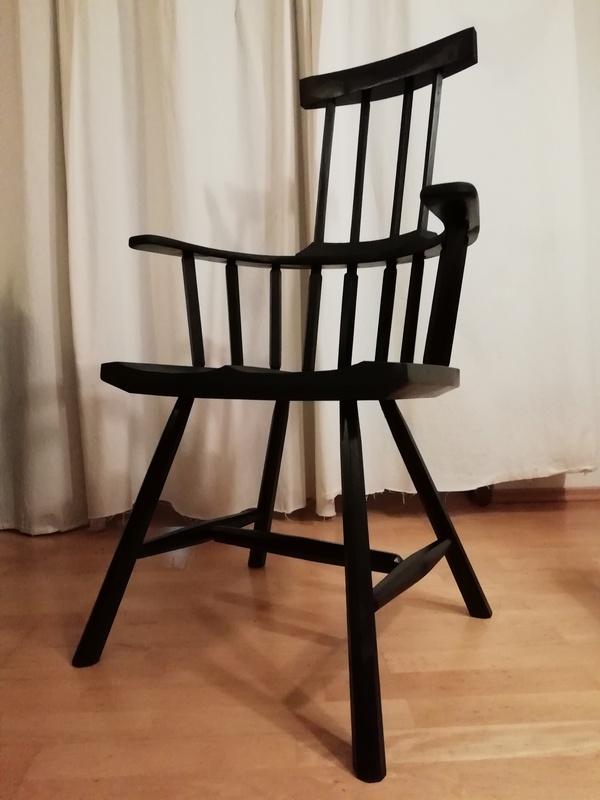 I took some advice from The Collective, and decided the way I wanted to fix the bits of my chair that weren't quite right, is with filling the holes with epoxy. An example of what I want to fix. Most of the advice was to bore the end of the stick out, and insert a plug. I decided against this, as the arm itself is not real thick, and the sticks are drilled at angles, complicating the whole thing a little. A couple of folks suggested (like Dyami) to fill with epoxy, and Aymeric suggested the brand West Systems. Having looked up West Systems products, I chose one that I could get here in Germany and one that was labelled as being especially clear in color. This stuff is favored by boat builders as a finish. If it is good enough for wooden boats, it is good enough for me. Besides, I probably have enough now to fix about a thousand chairs! Before I wreck my chair, though, I thought I would do a bit of practice. We have a bamboo cutting board with a hole in it because someone in the house (I won't say who) decided to use it as a backing board when drilling a hole rather than going to the shop to get a piece of scrap. The product I chose from West Systems had a recipe of 2/3 resin to 1/3 hardener. I precisely measured this ratio out by eye-balling it. With a small stick I dropped some into the hole and wiped the extra off with a paper towel. Here is what it looked like when I left it to dry. After an hour or so, it became clear that some of the epoxy was being 'sucked' into the wood. After an hour of drying. This morning, the epoxy had drawn in noticeably. I think that I would rather this not happened when I try this out on my chair for real. My plan is to use a chisel to pare a small amount of wood off of the end grain of the stick to clean it up, and drip some epoxy in the hole. Has anyone else had this happen using epoxy? I am wondering if the hole I am trying to fill needs pre-treating or multiple coats? Is there a way to get this to work with just one application? Am I doing something wrong? Could I be misinterpreting my results? Any feed back would be greatly appreciated. A friend was reading my last post in this series, and when he came to the part about why I call it "Fingers In the Till," he noted that my point was to stick my hand in my tool chest, and discuss whatever tool I pulled out. He suggested when I stick my hand in my tool chest that I be careful not to cut myself. Not to worry, as so far I haven't actually stuck my hand in my tool chest as much as pull up some photos that I have already published on my blog. However, the idea is the same. That is, to randomly pick a tool in my posession and do a review. My last post in this series was about my favorite tool. 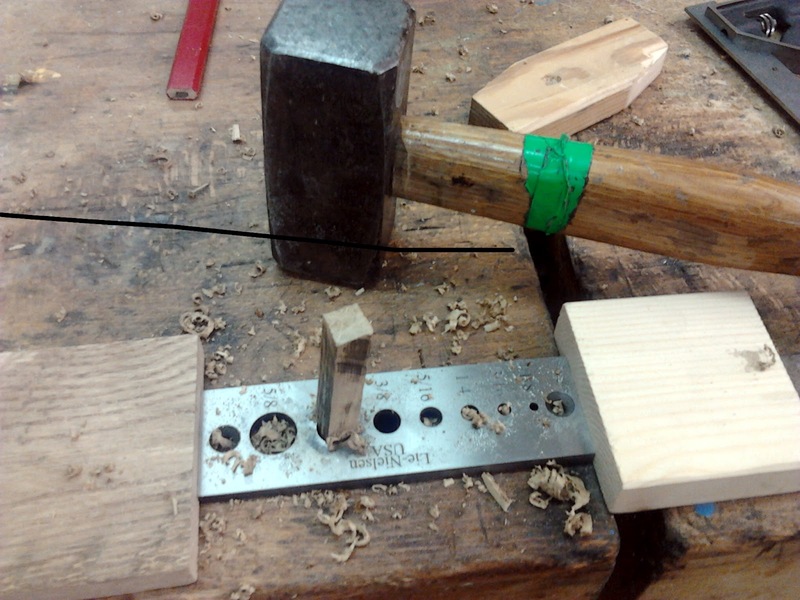 This post is about a little-used tool in my shop, but a very handy one. It is the Lie-Nielsen Dowel Plate. Lie-Nielsen Dowel Plate. Photo courtesy Lie-Nielsen Toolworks Inc.
A dowel plate is supposed to allow you to make your own dowels out of whatever stock you have on hand. In theory, you could have a limitless supply of dowels that you make yourself. Does it live up to this promise? Well, yes and no. If you have never used a dowel plate before, you may be disappointed with the results. This tool does indeed make precise dowels, but there will be tear out along the grain. Most likely it will not be usable as a show surface. If you want a good example, there is an episode of the Woodwright's Shop where Roy Underhill builds a hay rake. He rives his rake tine blanks and uses a home made dowel plate to make them round. If you have used a dowel plate, you might be impressed with the little details that Lie-Nielsen is famous for. Being such a simple thing, what details could be included in a dowel plate? Well, this tool has the hole sizes etched deeply in the plate, for one. This negates the need to guess. There is also a slight taper in the holes, which makes it easier for the pegs to come out of the plate. Here is my own. I think the discoloration comes from the heat generated. What I have found the dowel plate works well for is making dowels for pegged tenons. The long grain of the peg is buried in the wood, with only end grain showing. I do find it takes a bit of a knack to get good results. The way I use this tool is to start with a piece of scrap wood of the proper species you need, preferably with some straight grain. I try to saw my dowel blanks out with as little run-out as possible for maximum strength. If there is run out the blanks will likely break during this process. I try to saw my blanks out about the same size as my finished dowels, ensuring to avoid an undersized thickness. I like the dowel blank to be a good bit longer than I need. Once I drive them home, I like to have some sticking out on both sides. I try to saw out about twice as many of these as I need. Better to have one too many than just enough and one break. With a lot of extras (which take no longer to make), I can sort through them and pick out the very best for my project. Not all of these dowels will turn out suitably. Once I have my blanks sawn out, I put a blunt point on the end either with a pencil sharpener, a chisel, or my favorite, a floor standing belt sander. This point does not have to be sharp, just pointed enough for the end to pass through one of the holes on the dowel plate. I clamp the dowel plate over a dog hole, and put a bucket under the bench to collect the dowels as they come through. I should have made a video, this is way harder to describe than to see. If I am making 1/2" dowels, I put the blank on the hole one size bigger. I try to center it as best as I can, then bash it with the biggest hammer I have handy. I prefer a metal sledge for this, as they are oversize and the end will be sawn flush eventually anyway. On a side note, this makes an unholy racket, so keep that in mind if your shop is within hearing of civilization. This is probably the single loudest thing I do. Once I get close to the surface of the dowel plate, I don't have to do anything to get the dowel out. I just start a new one on top of the old. After a bash or two, it will drop out into the bucket while a new one is being formed. After running all the blanks through the oversized hole, I run them through the smaller hole. This usually takes a little bit more force. Here is where I'm glad I have a big hammer. Voilà! There now is a bucket full of dowels. I inspect them carefully, because some of them likely have a big flat on one side, as it didn't go into the plate quite straight. I have made a couple of dining tables using pegged tenons, and this worked perfectly for them both. I just bash them in (after applying a little paste wax to make it a bit easier), then trim them flush on the show surface. My walnut dining table with 1/2" pegs having been freshly driven home. I suppose this post has been about the use of any dowel plate. It is a simple thing to make one if you have the materials and means to drill different sized holes in a thick piece of scrap steel. An oak dining table with the pegs clearly visible. If you are like me, you will appreciate that this tool can be purchased. Lie-Nielsen's is nice because all the holes are labelled with the size of the hole, and the holes are tapered a bit to make it easier for the pegs to fall out. Lastly, there are countersunk screw holes on either side of it to facilitate screwing it down to something. I have to say I haven't experience with any dowel plate besides this one, but it does the job. I love being able to make dowels rather than have to buy expensive mail-ordered ones or use whatever species the Borg happens to have in stock. I feel that as long as I plan for a few failures the dowel plate works like crazy. If you think hand tool woodworking is on it's last leg, take a look at the profession of hand engraving sheet music. Our craft is vibrant and alive in comparison. Sadly, I think music engraving by hand is essentially dead. While there are undoubtedly a handful of small companies who may do it this way, they are far out of the mainstream, and surely re-evaluating their current business model. This craft is extinct enough that I found a photograph on the internet showing someone doing it only with the greatest of difficulty. For centuries, music was printed from a metal sheet that was carved in reverse (mirror image). The process of constructing this negative was known as music engraving, and it was done by hand. This takes an unimaginable amount of skill, as the layout is of utmost importance. Here is a video that shows the process. If you are an old-tool geek like me, you'll love this one. What I like best about this video is the part where he is laying out the different staves on a page using dividers. Up until the 1990s, there were still some big music publishers still producing sheet music this way. It just looks better than anything that can be done on a computer. I think it just became too expensive to do it the old-fashioned way. If music composer Joe Schmoe could print out his composition from his computer instead of paying a skilled craftsman who-knows-what the going rate is for hand engraving some parts for an orchestra to play, he can get his music out there and played. But that's not really it, is it. Joe Schmoe always would have written out his parts with pen and ink to save money this way. I think the publishing companies could save a buttload of money with a few technicians doing this digitally, as opposed to paying an army of highly skilled craftsmen to do it the old fashioned way. Professional-ish looking parts could be printed at home by any amateur. Editing a piece of music and getting it back to the performers quickly as opposed to leaving the typos in the printed music for decades, printing after printing. Giving composers another tool to use to listen, compose, and print their music. This is way, WAY easier to do now than ever it was by hand. Don't get me wrong, I am an expert with a couple of these music programs such as Finale, but most musicians are not that interested in getting good at music engraving. Usually people just want to get good enough at it that they can print something out, no matter what it looks like. Growing up in the '80s, I could expect to look at a sheet of music and only have to figure out how to get what I saw on the page to sound like what it was supposed to. Today, my community orchestra can not expect anything like the quality of music engraving of a decade or two ago. Even professionally published music has gone down incredibly in quality. As a performer, I should be able to expect to put a piece of music on the stand, and be able to play it without making photocopies, drawing lines, or interpreting what the composer "really wants." I should be able to expect the printed page to not get in the way of what I am trying to play. What does all of this mean to hand tool woodworking? I think this is an example of how fast technology can change an industry, for better or for worse. Not all progress is positive. Larry Williams says he thinks the art of making moulding planes was at its highest quality in the late 18th century, and every design tweak after that point was intended to make it easier to manufacture moulding planes. 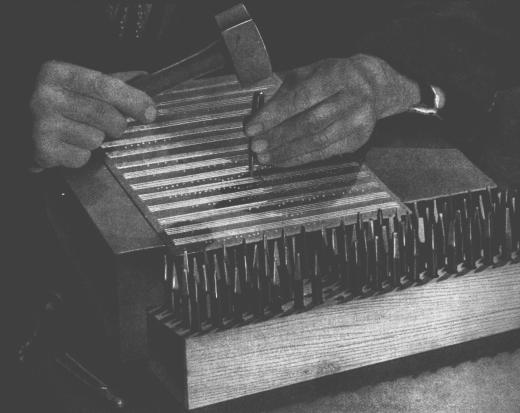 I think that music engraving was practiced enough by hand that there still are plenty of experts such as the man in the video still around, but once they are gone, this craft will be lost. If we as woodworkers do not want to teach our children to think IKEA furniture is the only furniture that technology can create, we need to keep making furniture the way we do. Our alternative is superior, and it still makes sense to craft one at a time the way we do. I do not think hand-tool woodworking is in immediate danger as music engraving is. But what will it be like in a generation or two? It could very easily disappear.